Acrocorinth has always been the fortress acropolis of Ancient and Medieval Corinth, being on a steep, rocky hill 575 meters high at its highest peak, with uninterupted views across the Corinthian and Saronic Gulfs. It has been an important fortified citadel throughout history for the Mycenaeans, Archaic Greeks, Macedonians, Romans, Byzantines, Frankish Crusaders, Venetians, Ottomans and eventualy back to the Hellenes following the Greek War of Independence, 1821-1829. More recently, there was a German garrison stationed there during the Second World War from May 1941. The Acrocorinth is only accessible on its Western side, where there is a triple wall with three successive fortified gates. Most of the defensive towers and walls we see today are medieval, but built on ancient foundations. There is a moat before the first outer gate, with cannon enplacements on the first and second middle gates. Once past the giant third gate, one sees a multitude of buildings, sancturies, mosques and a Christian church, which has three wall frescoes showing through the Ottoman clay plaster. The West peak has a high Frankish Crusader tower (pictured right) protecting the whole Triple wall access and the lower town. 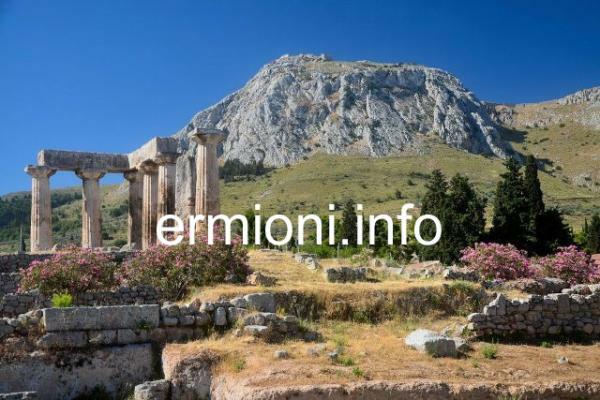 Within the Acrocorinth fortifications, at the highest peak, are the foundations and ruins of the famous Temple of Aphrodite. During the ancient period, up to a thousand of her 'priestesses' practiced the oldest profession, although most practiced in the city of Corinth itself. Not much is left of this archaic temple, only the foundation stones and a single column base, because other structures were built on this site during the Roman, Medieval and Ottoman Turkish periods. However, the long climb to the summit is worth the trouble, as the panoramic views from this point are just amazing, not just of Acrocorinth itself, but the new coastal city of Corinth and the whole Corinthian Gulf below. From Ancient Corinth, take the winding mountainside road which leads up to Acrocorinth. The distance to the Acrocorinth car park is approximately 4 kms. From the small car parking area, you will see the narrow access pathway which leads up to the first outer gate. This pathway continues through the first, second and third gates, and is made up of irregular cobblestones, so sensible footwear is advisable. Once through the third gate, the various pathways are beaten earth tracks, so take care if the ground is wet.